I just finished watching this amazing movie and i was moved to tears more than once. Did that hit me hard. Your inspiring to a slightly broken woman. Who was Raised by a broken woman. I find your bravery and stamina other worldly. I would like to know someone like you in my personal life. Jane, all the best with the documentary and thank you for sharing your story with us. I was deeply compelled to reach out to you because although we are so different- there are some strong similarities- which is so bizarre to me! But also shows Gods sense of humour! I am a 30 year old, black woman and lawyer in South Africa. I was born 22 December 1987 and you know when you were born. You are exactly 50 years my senior! When I was 13 my mother, our nanny and my little brothers were murdered. Your tragedy was at 12. I have been celibate for 8 years now and still counting- also not dating. I am not sure if the shop is closed, but I toy with the idea. A little similar to you- I feel that I would make a better partner than a spouse. Also because of the way I grew up I am not sure if I will be a good parent, so I have decided to be on my own for the forseeable future. There is a part of me that doesnt think anyone would accept me and everything I come with. I have had and still struggle with my mindset around food. I am doing the work on my mindset, but I know it is closely linked to my childhood and the death of my mother. I already had weight issues as a child while she was alive and 17 years later, it still this one thing I havent conquered. I feel like she died and left me fat.. and I am disappointing her by still being fat. For the most part I want to thank you- listening to you helped me feel that I will be ok in the future! I used to think I would want to die at 45, especially if I am not married- but heck- 80 looks good! Even if I am single. I am can trust that there is a full life ahead of me. Also it has alerted me to the importance of my family! My father and I have a great relationship, but I am going to keep ensuring that I cultivate it more and forgive him for places he has hurt me- rather than try to hurt him by using material things. I also want to spend more time with my mothers side of the family. My maternal grandmother is ill and i havent seen her in 17 years- I am going to do my best to spend Christmas with her this year. I had decided to already and this reaffirmed my decision. I look forward to watching the documentary and also this weekend I will buy your memoir because I am working on my own. The way you described writing yours gave me an idea of how to really do it properly, and thats what I have to do if I want to do it justice so it can help someone- the way you have helped me! Thank you Jane for making your documentary. I just watched it after my moms recommendation and I LOVED it. You are an amazingly strong woman, and I bawled my eyes out at the end. This is your act and you are inspiring. well done! Loved the film, made me cry at times. Very inspired by you and was looking forward to seeing you in Milwaukee on November 3rd…Very sad you had to cancel, I’m hoping that it is being rescheduled. Blessings Jane. Oh Jane!!! I’m late to the party here but I just have to tell you how much I admire you! And you life’s stories are going to teach so many people so many things for years to come! Miss Fonda – I wish I’d been among the lucky locals who got to meet you when you were filming “Our Souls at Night” in Colorado Springs. I was at least able to be in the area for some of the filming. It was a lovely film, by the way. The reason I’m writing is because I just watched your marvelous and inspirational documentary on HBO. It would be an understatement to say I sat riveted throughout. I’ve admired your work since the mid-60’s and believe you’ve shown us your impressive gift of acting since your earliest roles in “Tall Story” and “Walk on the Wild Side.” What we haven’t seen until now is what has propelled you to find answers and peace. Thank you for your courage and bravery and honesty. Most importantly, though, thank you for showing women that it’s never too late to find their own voice, to write their own narrative. I watched your documentary and recorded it so I can watch again and again. I absolutely LOVED it!! It was inspiring, brave, honest, a tearjerker, a confirmation of valuing oneself and the remedy to what I needed the day I watched it. I saw myself in so many scenarios of your life and I want to thank you for sharing. In 95,’ until the layoff in 2014, I worked at Turner Broadcasting. I remember taking an elevator with you one day while you were visiting. 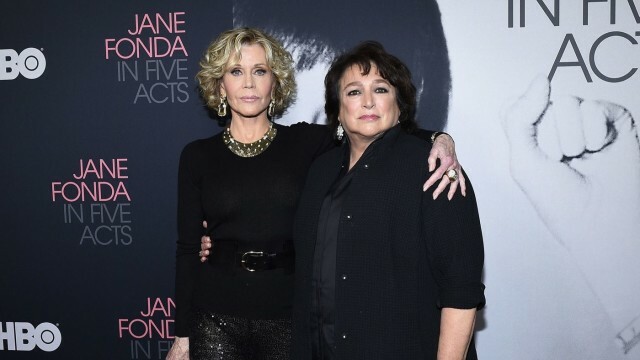 I told my mother (who later lost her battle with cancer), “Ma, I rose to the top with Jane Fonda today!” The top floor lol. My mother was a lot of your dad, there but not there. I think I spent my whole life trying to prove to her I was somebody to be proud of. When she died, I had to reset and figure out why I was hustling and grinding so hard and who was it now going to be for. I had to ask myself a bunch of questions and re-define my life for ME and my kids. My dad, who I found 14 years ago, suffered from mental illness and bi-polar disorder. I was able to get “abandonment” closure with him as I became his guardian before he too lost his battle with cancer this past December. I’ve been living in Atlanta over 23 years now. Single Mom (divorced) raising two daughters (yes, it’s tough sometimes). I started my own independent production company to tell stories that change lives. http://www.balancingactsent.com is my website if you’re able to look at it. This entire year, I’ve been filming a documentary to help children dealing with mental health issues. I know it’s a long shot, but I grew up dirt poor and here by the grace of God because I never was afraid to ask, but I would love to interview you for it. I’ve interviewed some amazing people out there walking the walk to help and survivors. I think you would love what it’s about. Not sure who I should contact, but would love to try. Well beautiful, inspiring woman thank you for showing so many of us how to pick yourself up and dust yourself off when life throws LIFE at you. I pray for continued blessings for you and your always. I hope to ride the elevator again with you one day. I would love to chat with you and get your advice!